Cognitive Behavioral Therapy, or ‘CBTi’ for short, trains people to use techniques that address the mental (or cognitive) factors associated with insomnia, such as the ‘racing mind’, and to overcome the worry and other negative emotions that accompany the experience of being unable to sleep. 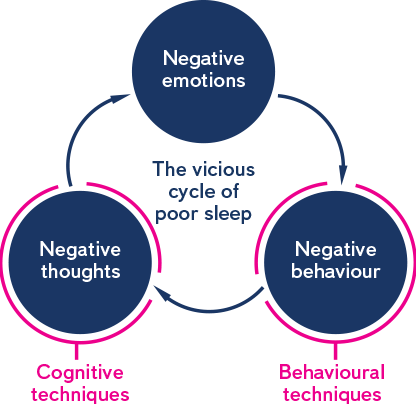 Fig 1.The vicious cycle of poor sleep and how CBT for insomnia can help overcome it. In addition, CBT helps people with poor sleep establish a healthy sleep pattern. This behavioral element supports people to develop a ‘pro-sleep’ routine and to achieve strong connection between bed and successful sleep, meaning that falling asleep and staying asleep in bed becomes more automatic and natural. Sleepio allows people to access these proven, tailored CBT techniques and receive continuous support, all via the web and at a time that suits you. So if you’re too busy to leave work to visit a therapist for an hour each week, this online treatment will be perfect for you. Cognitive behavioral therapy also teaches people how to get a more reliable sleep from night to night. Most poor sleepers have a very unpredictable sleep pattern. They live with uncertainty of what the night will hold for them, compared with good sleepers, who can rely on their sleep being stable and satisfying. The consequences of improved sleep and less sleep-related worry are that most people who follow a CBT program for insomnia feel much better during the daytime too. Indeed, many of the techniques that people learn are helpful for the stresses and strains of daily living because they help people feel more organised and more in control in general. Does CBT for insomnia work? CBT is what we call an ‘evidence-based therapy’, meaning that it has been shown to be effective in controlled scientific clinical studies. The earliest research in fact goes back more than 30 years, so several decades of evidence has accumulated to show that CBT can teach people how to fall asleep faster, stay asleep and feel better during the day. ‘Randomized Controlled Trials’ (or RCTs) are the gold standard method for evaluating whether a treatment is effective. Participants are randomly allocated to receive the treatment in question, no treatment or, in some cases, a placebo (ie. false but convincing) treatment. By comparing differences between groups we can confidently assess whether the real treatment truly works, and confirm that any improvements are not down to chance, some other external factor such as changes in the weather, or to people just believing they will get better. CBT for insomnia has been assessed in over 100 RCTs, and the results show that on average 70% of people with even very long term poor sleep obtain lasting benefit from the treatment. Scientific studies have also shown that poor sleepers generally would prefer a practical approach based on CBT compared with taking sleeping pills. Indeed, the evidence is that CBT helps most people achieve sustained long-term improvements in their sleep, whereas the effects of sleeping pills are mostly short-term. On the basis of such findings, the National Institute of Clinical Excellence (NICE) in the UK advocate CBT as the preferred option for persistent poor sleep problems.